Simon Raik-Allen shares from his experience as a CTO, building great products and guiding hundreds of engineers. Anupama Natarajan presents key principles to consider when designing RESTful APIs based on her experience designing them for real-world applications. Col Perks looks at API design as a style, considering the qualities that might make an API beautiful and providing real world examples. Glenn Block introduces Hypergoal, a way of creating distributed workflows with hypermedia clients. Gareth Evans and Rick Mugridge share the patterns that emerged while developing hypermedia APIs for various companies over time. 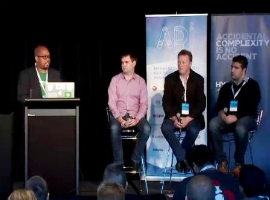 Dennis Ashby moderates a panel discussing the role of APIs in building microservices and the challenges to be overcome. Martina Iglesias Fernández discusses Spotify’s approach to documentation through automatic discovery of existing endpoints, service configuration, and deployment information at runtime. Steven Cooper discusses using machine learning to understand malformed API requests to not only respond with a best fit response, but capture the user errors for future responses.